Cabinet spokesperson Hanu Salah said in a phone interview with local private channel ON tv that the first day of the constitutional referendum witnessed "positive feedback and turnout rates that can be the highest in all polls organized since the 2011 revolution." Egypt is braced for the second day of a constitutional vote, after the first day marked jubilant crowds of voters and clashes across the country. To follow the story, click here. Local newspaper "Egypt Independent" carried unofficial reports that former Egyptian presidential candidate Hamdeen Sabahi was unable to vote due to a database error. Egyptian security officials say clashes between police and protesters loyal to the country's ousted president have killed three people on the first day of a key vote on Egypt's new charter. Tuesday's clashes in the city of Sohag came hours after Egyptians started voting on the new constitution, which represents a key milestone in a military-backed roadmap put in place since the ouster of Mohamed Morsi last July. 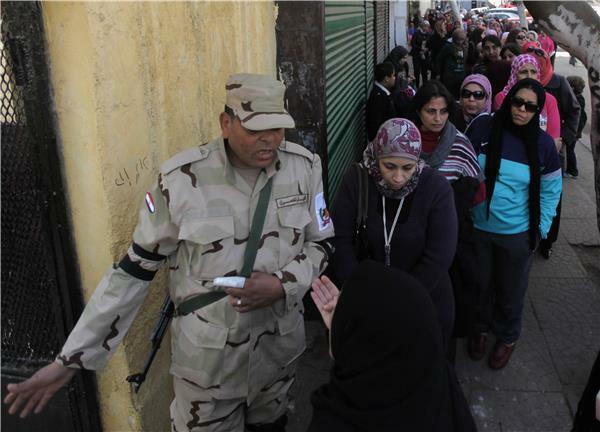 A massive security operation is underway to prevent Morsi's supporters from disrupting the vote and in anticipation of attacks by Islamic militants. 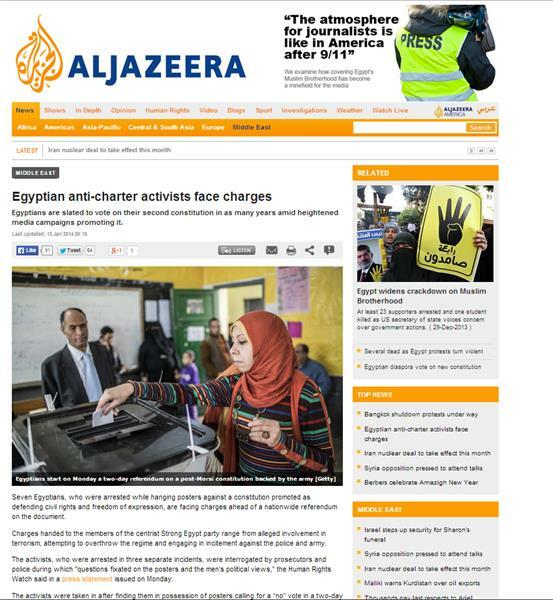 This is an unconfirmed report about the monitoring of news agencies in Egypt. Have you heard about this? What do you think? We believe that the Egyptian government should protect the rights and freedoms of its citizens, and we call on authorities to release all journalists being held behind bars in Egypt. Journalists everywhere should be able to work openly and freely without fear of reprisal. Correspondent Sue Turton reacts to state-run newspaper Ahram Gate's report that security forces have allegedly rounded up a group of Al Jazeera's cameramen and correspondents. Umm Mostafa, a housewife in Agouza, said she's voting yes because of Sisi. "He will unite the nation. Muslims, Christians, we all drink from the Nile. We need a strong man to protect the nation and end the strife." 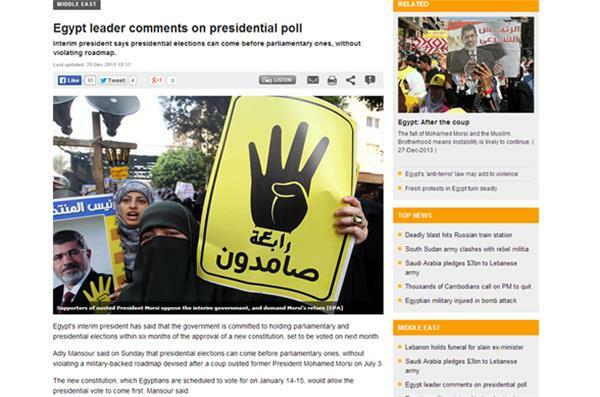 Reuters is reporting one dead during the clashes between security forces and supporters of ousted President Mohamed Mursi's Muslim Brotherhood on the first day of the referendum. Local newspaper al-Youm al-Sabea reported that Mohammed Abu Hamed, a former MP and spokesman for the Pro-Sisi Front, survived an assassination attempt in Alexandria on Tuesday at dawn. The Front said that a truck chased the former MP during his return from a meeting of the members of the Front in Alexandria ahead of the referendum on the constitution. The incident took place on Egypt - Alexandria desert road. @AJELive democracy has long way to come, for a country where a dictator had been in power for more than 30 years. State-run newspaper Ahram quotes Minister of Domestic Development Adel Labib as saying that there are 52 million 742 thousands voters eligible to cast their ballot for two days starting tomorrow on the country's second constitution since the 2011 revolt. Human Rights Watch denounced the arrest of seven activists for hanging banners promoting a "no" vote during a two-day referendum on a constitution that starts Monday. The members of the centrist Strong Egypt party are facing charges ranging from involvement in terrorism, overthrowing the regime and inciting against the army and the police. Police have fired tear gas at university students in Cairo as they demonstrated in support of ousted president Mohamed Morsi. Clashes between police and the protesters erupted in front of Cairo University, Al-Azhar University and Ain Shams University on Sunday, security officials said. 19 students, including four women, were arrested . Sunday's clashes came as Egypt's military-installed authorities prepare for a referendum on a new constitution, which is due to take place on Tuesday and Wednesday. The military has said it will deploy 160,000 soldiers to guard some 30,000 polling stations during the referendum. Hundreds of students have clashed with security forces at a main Cairo university. The clashes on Sunday came as Egypt's Interim President Adly Mansour urged voters to head to the polls to cast ballots on Tuesday and Wednesday. Mansour said that the draft charter used "moderate" Islam as a base for legislation. He also asked voters "to lead the ship of the nation to the shores of safety." AP news agency did not specify which university the clashes took place at. Egypt's more than 52 million voters will decide whether to support amendments to the constitution initially drafted under toppled Islamist President Mohamed Morsi. 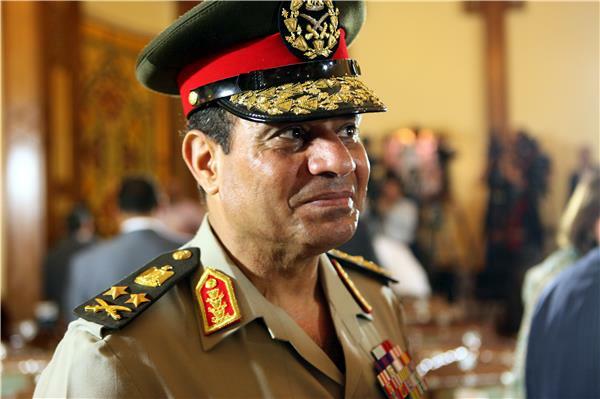 The military overthrew Morsi in a popularly backed coup in July. 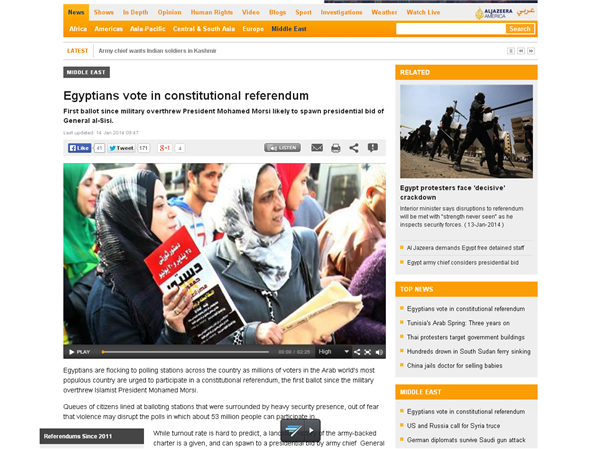 The military-backed interim government sees the vote as a milestone in legitimizing Morsi's removal. Egypt's army chief Abdel Fattah el-Sisi said he would run for president if the people demand it and the military supports him, state media quoted him as saying on Saturday. feels he "would not have the luxury or choice" to stand aside in the election if there is a palpable demand for him to run in the poll. A member of the audience confirmed the comments to AFP. The interior ministry has confirmed at least 169 arrests during today's protests. said, ahead of a referendum next week on a new constitution. 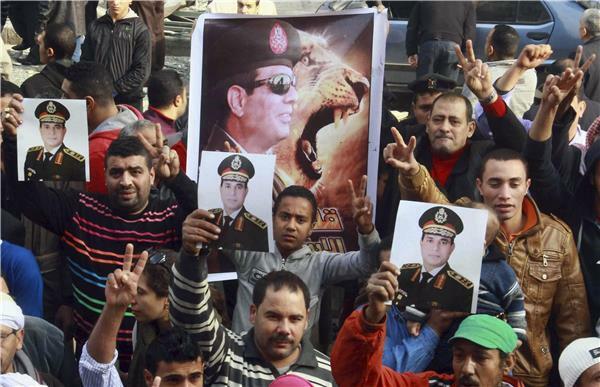 chief General Abdel Fattah al-Sisi's popularity. Egyptian airport authorities have arrested an Egyptian-born American who belongs to the outlawed Muslim Brotherhood on charges of taking part in violence against the state, security sources said on Thursday. The man, identified as 47-year-old Khaled Mahmoud Migahid, is accused of burning police stations, said the security sources. Ousted Egyptian leader Hosni Mubarak's last prime minister, Ahmed Shafik, said in a television interview broadcast on Thursday that he would run for president if the army chief does not contest elections. "I believe now I will run for the presidency," Shafik told Al Qahira Wil Nas television, adding that he would compete if army chief General Abdel Fattah al-Sisi stayed out of the race that is expected later this year. Shafik left Egypt last year after being defeated in the presidential election by Mohamed Morsi, the Muslim Brotherhood politician since overthrown by the army and now on trial for conspiracy and inciting violence while in office. Last month, Egyptian courts acquitted him in one corruption case and shelved another. The next milestone is a Jan. 14-15 referendum on a new constitution. Shafik, a former air force commander who cited Mubarak as a role model during his election campaign, lost narrowly to Morsi in the run-off. 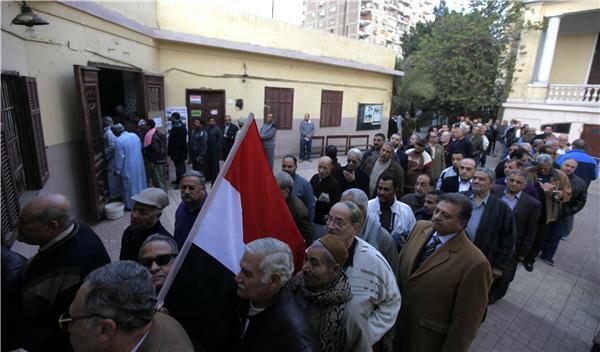 Speaking from the United Arab Emirates, Shafik said it was possible he would return to Cairo to vote in the referendum. Osama Morsi, the son of the deposed president and a member of the defence team, has been banned from entering the court where his father's trial is due to take place. Our correspondent is reporting clashes between Pro-Morsi protesters and security forces in Cairo's Nasr City district. Deposed Egyptian president Mohamed Morsi has arrived at the Cairo police academy for his court trial. He was airlifted by helicopter, State media reports. Deposed Egyptian president Mohamed Morsi is due to stand trial on Wednesday for the incitement of violence relating to the deaths of protesters outside the presidential palace, during clashes in December 2012. The trial is set to take place at Cairo's police academy. In 2013, A state prosecutor charged Morsi and 14 other Brotherhood members with "committing acts of violence, and inciting killing and thuggery", the state news agency reported. The charges relate to violence in which around a dozen people were killed outside the presidential palace in December 2012, after Morsi had ignited protesters' rage with a decree that expanded his powers. The charges against Morsi include inciting his followers and assistants to commit crimes of premeditated murder and use violence and thuggery. An Egyptian labour ministry official and three trade union activists were kidnapped in the Sinai on Tuesday, the ministry said, and police are investigating whether militants are behind the abduction. In Cairo, assailants threw a bomb and opened fire on a small traffic police station without causing casualties, security officials said. It was the latest in a string of attacks on security forces following the overthrow of Islamist president Mohamed Morsi in July. 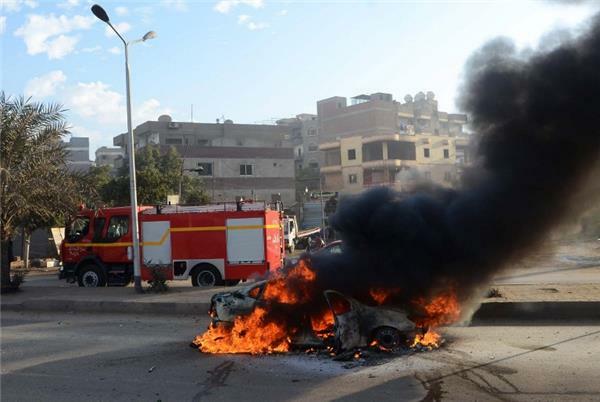 Much of the violence has taken place in Sinai, where the officials were abducted while en route to a conference in the southern resort town of Sharm El-Sheikh. A famous pro-Muslim Brotherhood TV cleric based in Qatar issued a religious edict on Tuesday saying it is forbidden to vote in Egypt's constitutional referendum because it gives legitimacy to Cairo's new leadership. Egyptian cleric Youssef el-Qaradawi issued a fatwa, or religious edict, a day before Egyptians abroad are set to vote on the draft charter. 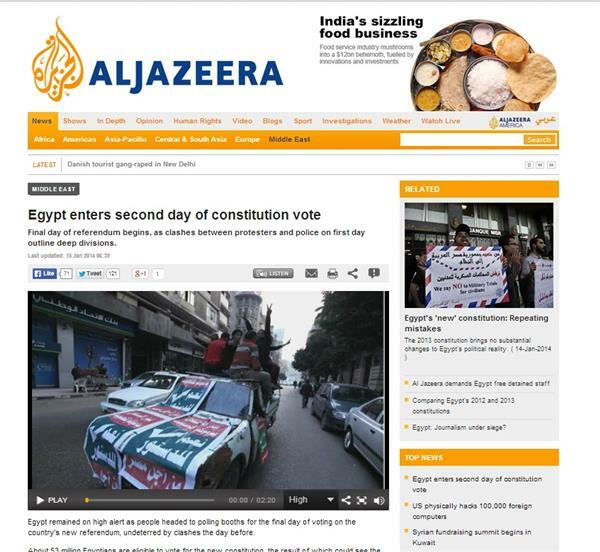 Of Egypt's roughly 681,000 registered voters abroad, about 42,000 are based in Qatar. El-Qaradawi, said that participating in the upcoming referendum constitutes a continuation of injustice and oppression. Egypt's interim president on Sunday made a rare visit to see the pontiff of the nation's Orthodox Christians at St. Mark's Cathedral, the papal seat in central Cairo, according to a brief statement by the church. Verdict: @alaa @Monasosh and others one year with labour suspended for 3 years. Alaa Abdel Fattah and his sister, Mona, who are both two prominent activists who played a big role in the 2011 revolt that toppled former president Hosni Mubarak, have both each received a suspended year in prison sentence for allegedly burning down the electoral campaign headquarters of former presidential candidate and Mubarak, Ahmed Shafik, during elections in May 2012. Local media reported in June 2012 that Shafiq has relinquished the lawsuit, saying that he won't be “a stick to hit revolutionaries." A driverless bus careered down a Cairo street toward riot police, smashing into parked cars as the police scrambled to safety during a protest on Friday in defiance of a ban. The protesters, who were responding to a call to demonstrate by an alliance that backs ousted president Mohamed Morsi, had disengaged the handbrake on board the bus and turned the vehicle into a weapon. Police in an armoured van managed to reverse out of harm's way. It was one of many defiant acts across Egypt on Friday as Morsi's supporters rallied in spite of a ban on demonstrations a week after the military-installed government declared his Muslim Brotherhood movement a "terrorist organisation". "Egyptians don't know fear," said Houeida, a protester who came with her husband and four children, moments before the clashes erupted in the Cairo neighbourhood of Nasr City. She brushed off the threat of a harsh prison term the Islamist protesters now face with the Brotherhood's designation as a terrorist group. 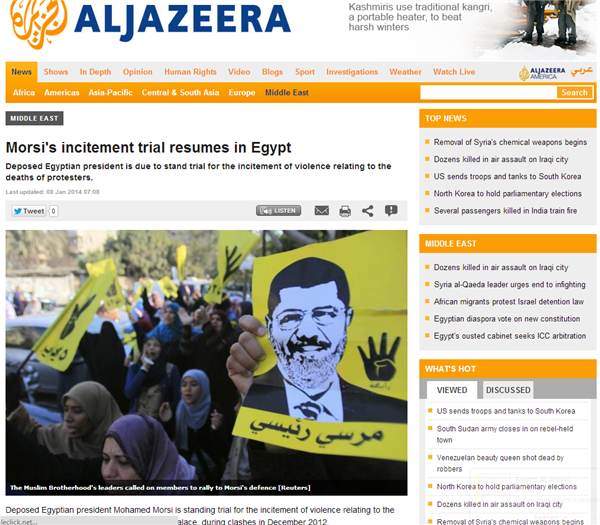 Inside Story - Egypt: Selective jusitice? Seven people, including the son of a Muslim Brotherhood leader, have been arrested in connection with a suicide bomb attack on a police station north of Cairo that killed 16 people last month, the interior minister said. The army-backed government listed the group as a terrorist organisation after accusing it of carrying out the attack, one of the worst Egypt has faced since the army deposed Islamist Mohamed Morsi in July following protests against his rule. The Brotherhood, which won five consecutive elections since the overthrow of autocrat Hosni Mubarak in 2011, denies any link to violence. A Sinai-based militant group, Ansar Bayt al-Maqdis, claimed responsibility for the December 24 attack in Mansoura. "Seven of the accused have been arrested, most prominent is Yehya Almongi Saad al-Huseini who is the son of a Muslim Brotherhood leader," Interior Minister Mohamed Ibrahim said. Ibrahim also accused the Muslim Brotherhood of opening up lines of communication with the group Hamas in neighbouring Gaza and receiving military training from them. He accused Hamas of involvement in various attacks in Egypt in recent months, without giving details. Hamas, founded in 1987, is an offshoot of the Muslim Brotherhood. A spokesman from Hamas, Sami Abu Zuhri, denied the accusations and called it an "attempt to mislead the Egyptian public and export the internal Egyptian crisis". Two people have been killed in violent clashes between supporters of ousted President Mohamed Morsi and police in Egypt's coastal city of Alexandria, the Ministry of Interior said. The Interior Ministry said the clashes erupted late on Wednesday during two marches organised by some 200 Muslim Brotherhood members in Alexandria. shot and clashed with and terrorised the people," the ministry said in a written statement on Thursday. It said some residents had exchanged fire with the Brotherhood protesters, killing two people and injured three police officers. 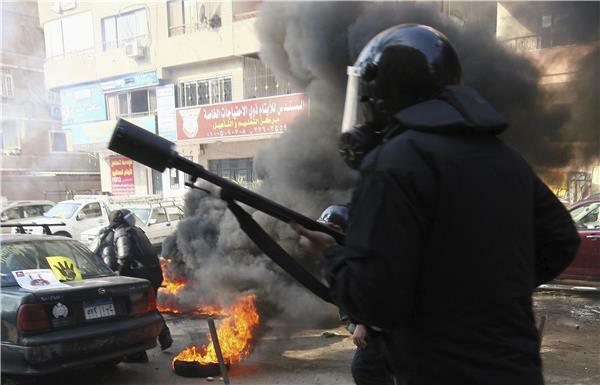 Police ended the clashes and arrested 10 protesters, the Interior Ministry said. Inside Story - Egypt: An assault on free press? Egyptian police fired tear gas and water cannons at hundreds of pro-Islamist protesters demonstrating near the Defence Ministry in Cairo on Wednesday, state media said. Protests have been staged by supporters of Islamist president Mohamed Mursi since the army removed him from office in July after mass protests against his rule. On Wednesday, the state-run Al-Ahram website said about 300 university students from the Muslim Brotherhood had blocked a road near the Defence Ministry and chanted anti-police and army slogans. "The police had to use water cannons and tear gas after the students refused to open the street and leave," Ahram said adding some protesters were arrested. Police also fired tear gas on pro-Mursi student protesters from the state's main university in the Nile Delta city of Zakazik, Mursi's home town. Unknown assailants have attacked a natural gas pipeline in the Sinai, Egyptian security sources told Reuters, raising concerns of instability as the country pushes through with a roadmap for political transition to democracy. The blast took place on Tuesday in the central region of Sinai on a pipeline that carried natural gas to an industrial area. There were so far no reports of casualties and security forces are scanning the area to investigate the cause of the blast, the sources said. Egypt has been struggling to maintain stability in the country of 85 million people since the army ousted President Mohamed Morsi, the country's first elected leader, on July 3 following mass protests against his rule. Egypt's interim government has ordered the assets of more than 500 Muslim Brotherhood and Islamist leaders seized, senior judicial and security officials said Tuesday. Abdel-Azzem el-Ashri, a Justice Ministry spokesman, said that a ministerial inventory committee ordered the "movable and immovable properties'' of 572 Muslim Brotherhood leaders seized. Another Justice Ministry official said leaders on the list included toppled President Mohammed Morsi and his family, as well as provincial Brotherhood leaders and members of its General Guidance Bureau, which is the group's executive body. A security official said the list also included female Muslim Brotherhood members like Azza el-Garf and wife of leader Khairat el-Shater and his daughter. He said other Islamist leaders include Assem Abdel-Maged, the leader of Gamaa Islamiyah, which waged an anti-government insurgency in 1990s against autocrat Hosni Mubarak. The two officials said that the list includes those indicted in cases of inciting violence and those are under investigation or could be investigated. Egypt's interim president has said that the government is committed to holding parliamentary and presidential elections within six months of the approval of a new constitution, set to be voted on next month. Adly Mansour said on Sunday that presidential elections can come before parliamentary ones, without violating a military-backed roadmap devised after a coup ousted former President Mohamed Morsi on July 3. The new constitution, which Egyptians are scheduled to vote for on January 14-15, would allow the presidential vote to come first, Mansour said.